Several animals sleep snugly in Nick's lost mitten until a bear sneezes. One by one, woodland animals find the mitten and crawl in; first a curious mole, then a rabbit, a badger and others, each one larger than the last. Finally, a big brown bear is followed in by a tiny brown mouse, and what happens next makes a wonderfully funny climax. 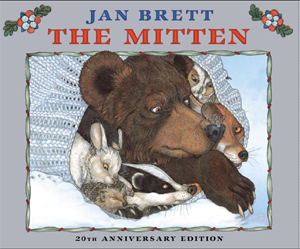 Once again Jan Brett has created a dramatic and beautiful picture book in her distinctive style. She brings the animals to life with warmth and humor, and her illustrations are full of visual delights and details faithful to the Ukrainian tradition, from which the story comes.